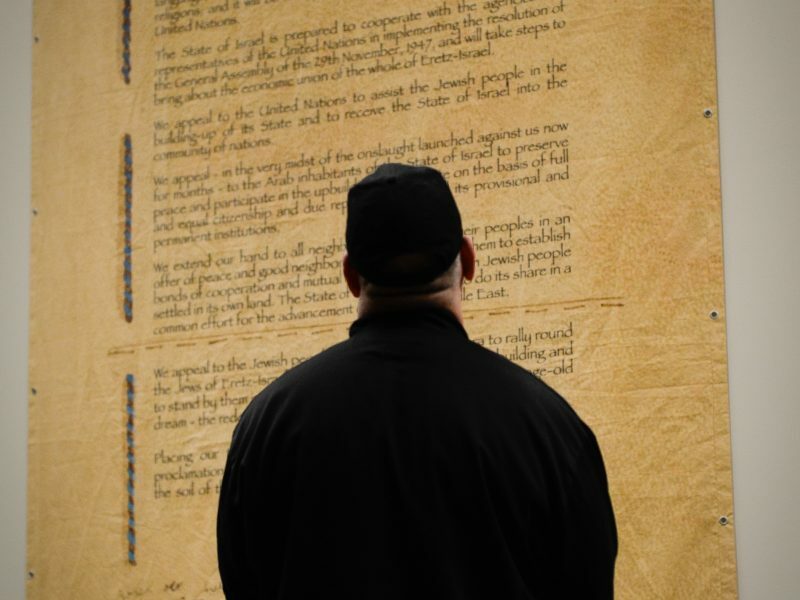 A man stands in front of a copy of Israel’s Declaration of Independence at the We Declare event in February. Israel at 70 culminated in a celebration of Israel’s 70th Independence Day on April 19 and Café Shahor Hazak on April 26. 7 Months, 70 Faces, 7 Decades of Israel! Even though spring weather did not arrive when we flipped our calendars to April, it’s time to celebrate Israel’s Independence Day. It’s a time we move from sorrow to celebration, from Yom Yom HaZikaron (April 17) to Yom HaAtzmaut (April 19), recognizing our connections and relationships with Israel. This year, as Israel celebrated its 70th year, we extended our celebrations and brought Israel—a modern 2018 Israel—to the community through interactive events and a grand celebration of the arts. 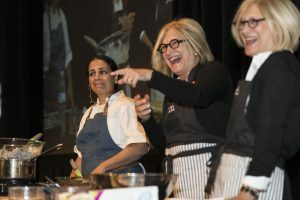 The theme of this yearlong celebration was the 70 Faces of Israel. The concept of “70 faces,” which is to say many faces, refers to the Torah—a text that has 70 faces, or many layers and ways to be understood and interpreted. We wanted to take that concept and extrapolate it to explore the many faces, layers, and realities of Israel. While the Mayerson JCC and the Jewish Federation of Cincinnati work every year to bring the modern, relevant, and diverse realities of Israel to our community, we wanted this year to be a celebratory in nature. We envisioned a celebration through the arts. Our goal was to bring as many artistic impressions from Israel as possible in order to uncover the many ways to understand and connect with Israel. 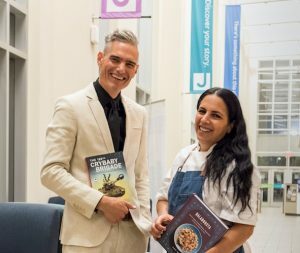 We began our celebration in October, when we explored Israeli cooking and comedy with Einat Admony and Joel Chasnoff in Belly Laughs. We explored Hebrew poetry in A Poem on the Road, a special live exhibition, where poems were placed in unconventional places around the JCC. We heard from world-renowned Israeli author Eshkol Nevo about his new book Three Floors Up and his writing process. We explored visual art and re-art as ten Cincinnati and Netanya artists created their own pieces of art reflecting their understanding of Israel, then re-arted each other’s work. This unique exhibition was done and led by our Partnership2Gether (P2G) committee in collaboration with the Cincinnati Skirball Museum at Hebrew Union College-Jewish Institute of Religion (HUC-JIR). Hundreds of people visited the exhibition, which created a lively discussion about art, Israel, and Jewish peoplehood. During the month of February, we celebrated Israel through film. Galit Roichman, a screen writer and film lecturer, was our scholar-in-residence for the Jewish and Israeli Film Festival. Galit took us on a cinematic journey exploring cultural changes in Israel throughout the decades. We concluded February with an exciting day of learning around Israel’s Declaration of Independence, in collaboration with HUC-JIR. Dr. Zohar Raviv spoke about Israel’s Jewish and democratic character and our changing relationship with the state. Then ten great educators and rabbis taught us about many different aspects of the Declaration itself. 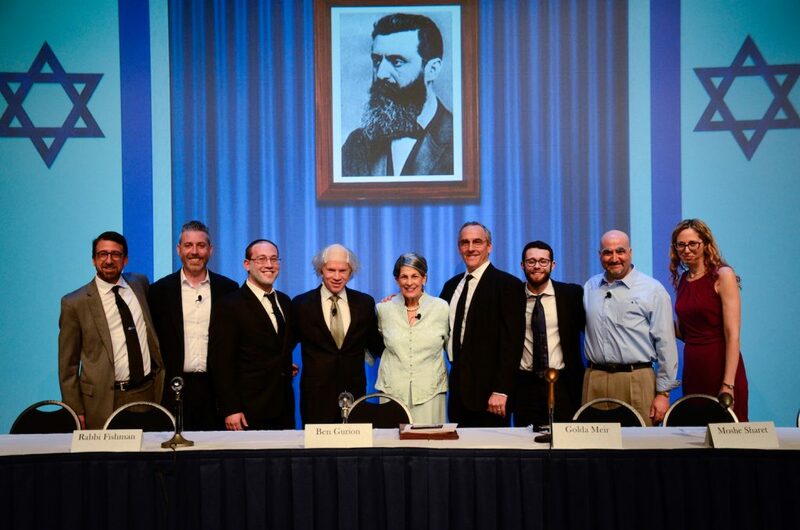 We concluded the day with a creative reenactment of the declaration, where we met Golda Meir, David Ben Gurion, Moshe Sharet, and others on stage. We also enjoyed the creativity of the Koresh Dance Company as they performed at the Aronoff center, bringing a unique flavor and rhythm from Israel. And now it’s April. Israel is turning 70, and we will celebrate with Israel her special week. We began with sadness on Yom HaZikaron as we commemorated Israel’s fallen soldiers and read the letters that they left behind. We will move to celebrating with Israel its Independence Day. Yom HaAtzmaut will be a family-friendly way to explore the faces of Israel. We will light seven torches in honor of Israel and will conclude with the Humans of Tel Aviv event for the adult audience. Lastly, we will round out our Israel at 70 celebration with Café Shahor Hazak at Memorial Hall on Thursday, April 26. A hip-hop group of Israelis of Ethiopian origin—and originally from Netanya, our partnership city—will help us conclude a year of celebrating the 70 faces of Israel. A very special thank you to our Israel at 70 chairs, Fred and Kathy Kanter. Also, thank you to our sponsors Dr. and Mrs. Stephen N. Joffe, Fifth Third Bank, and The Jewish Foundation of Cincinnati.